NASA, in conjunction with astronomers from Penn State University, has unveiled a stunning set of ultraviolet images of the Large and Small Magellanic Clouds, the Milky Way’s two closet galactic neighbors. The images are the most detailed portraits ever of the two irregular dwarf galaxies that are thought to be orbiting the Milky Way. In a press release, NASA stated that the Ultraviolet/Optical Telescope aboard the Swift satellite took over 2,000 images, which were then assembled into the seamless portrait you see below. "We took thousands of images and assembled them into seamless portraits of the main body of each galaxy, resulting in the highest-resolution surveys of the Magellanic Clouds at ultraviolet wavelengths," said Dr. Stefan Immler, a research scientist at NASA’s Goddard Space Flight Center in Greenbelt, Md. Immler proposed the program and headed the agency’s contribution. 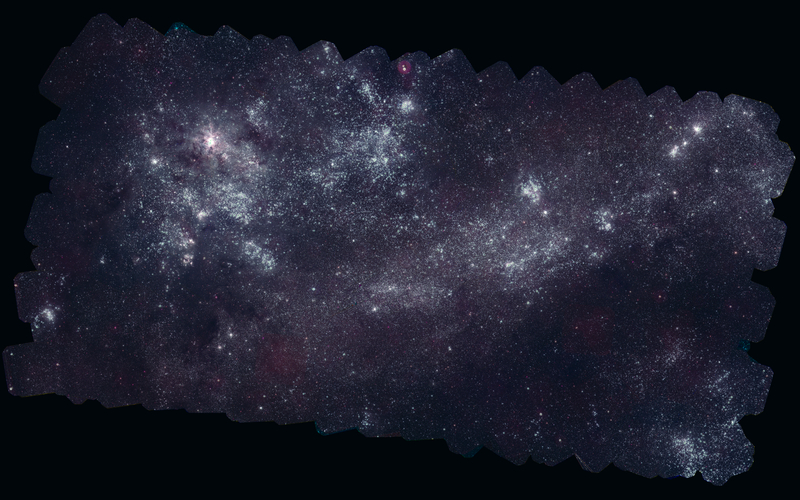 The images, measuring 160-megapixels for the Large Magellanic Cloud and a 57-megapixel for the Small Magellanic Cloud, come in at a whopping 55MB and can be found in high resolution here. "Prior to these images, there were relatively few UV observations of these galaxies, and none at high resolution across such wide areas, so this project fills in a major missing piece of the scientific puzzle," said Michael Siegel from Pennsylvania State University in State College. The LMC as it appears in visible light. The galaxy's most prominent object is the sprawling Tarantula Nebula (middle left), the largest star factory in the LMC and the most active star-formation zone among the dozens of galaxies that make up the Local Group, which includes our own Milky Way and the Andromeda galaxy (M31). The LMC is about 14,000 light-years across. Credit: Axel Mellinger, Central Michigan Univ. This optical view of the LMC is co-aligned with the Swift UV image. Axel Mellinger, Central Michigan Univ. The Large and Small Magellanic clouds are the Milky Way’s closet galactic neighbors, measuring 163,000 light-years and 200,000 light-years away, respectively. Although the Large and Small Magellanic clouds are but a fraction of the size of the Milky Way (the Large Magellanic cloud is only one-tenth the size with roughly one percent the mass), they are visible to those in the southern hemisphere because of their proximity. Yet the images offer a more complete portrait of the two galaxies because Swift’s Ultraviolet/Optical Telescope is able to block out much of the visible light. “Viewing in the ultraviolet allows astronomers to suppress the light of normal stars like the sun, which are not very bright at such higher energies, and provides a clearer picture of the hottest stars and star-formation regions. No telescope other than UVOT can produce such high-resolution wide-field multicolor surveys in the ultraviolet. Swift's wide-field imaging capabilities provide a powerful complement to the deeper, but much narrower-field imaging power of NASA's Hubble Space Telescope,” said Francis Reddy, author of the press release. The Swift satellite is part of the Swift Gamma-Ray Burst Mission launched in 2004 to study energetic explosions in distant galaxies. The onboard instruments, including the Burst Alert Telescope, the X-ray Telescope, and the Ultraviolet/Optical Telescope, provide astronomers the capabilities to monitor these explosions from their initial burst through their “afterglow” which typically consists of longer wavelength light.